Powerplant: Four General Electric J79-5B afterburning turbojets, 15,600 lbs. thrust each. Weight: Empty 55,560 lbs., Loaded 164,500 lbs., Maximum take-off weight 165,000 lbs. Dimensions: Wingspan 56’10″, Length 96’9″, Height 31’5″. Performance: Maximum speed 1,385 MPH (Mach 2.1) at 44,000 feet, Cruising speed 600+ MPH, Service ceiling 64,000 feet. The B-58 Hustler garnered a number of “firsts” during its relatively short service career. It was the first supersonic bomber, the first bomber to reach Mach 2, the first aircraft made of stainless steel honeycomb sandwich and the first aircraft to have stellar-inertial navigation. The B-58 also set more world speed records than any other type combat aircraft. 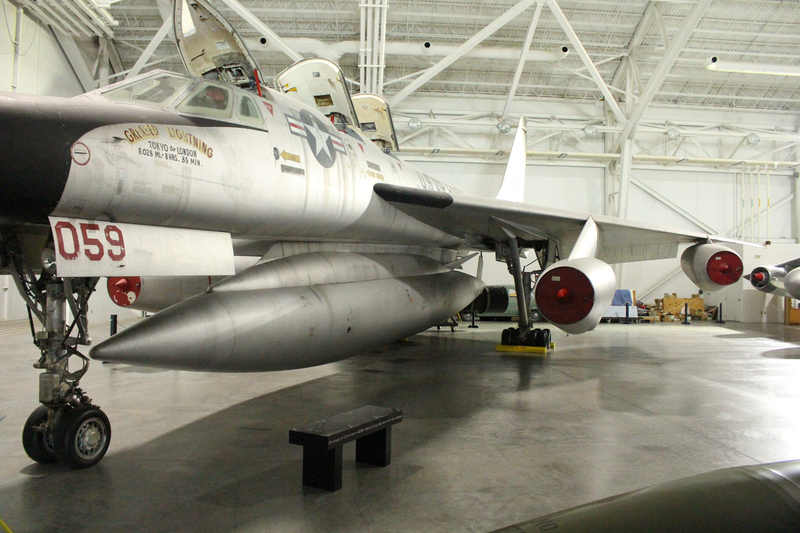 About Our B-58, S/N 61-2059 : The aircraft was accepted by the USAF on 16 February, 1962.